Snowed in? We put out a call for Seattle Times readers and staffers' favorite places for outdoor fun in the snow. Here's where to go if you need a fresh snow-day itinerary. On Friday, as Seattle hunkered down and cleared grocery store shelves in anticipation of this week’s weather, we put out a call for readers’ and staffers’ favorite sledding and urban ski spots, and you delivered. We heard from a surprising number of urban cross-country skiers and other outdoors enthusiasts. You recommended sledding on the hills at Seattle Pacific University and among boisterous crowds on Queen Anne. 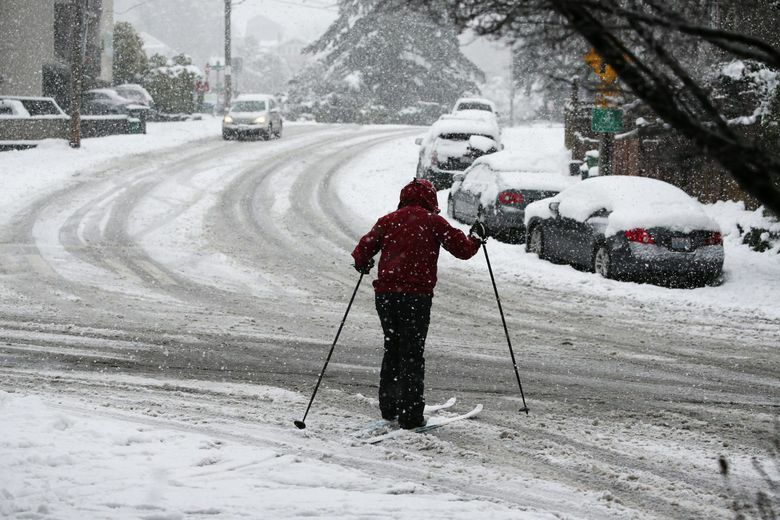 You suggested that urban cross-country skiers take a jaunt around Green Lake if the snowpack is intact. You warned against the use of skate-skis on city pavement (I agree with this, although I think if someone is ski-savvy enough to own that equipment, we can probably trust them not to trash it). One brave soul suggested sledding down Dravus Street in Magnolia. “No way. Excessively dangerous,” another commenter responded. And not a few of you balked at the idea of folks sledding down city streets at all, instead encouraging diversions to car-free city parks. Here’s what else you had to say.